Last Thursday, I woke up, put on my favorite suit and brought the voices, stories, and demands of ColorOfChange members to the President of the United States of America. 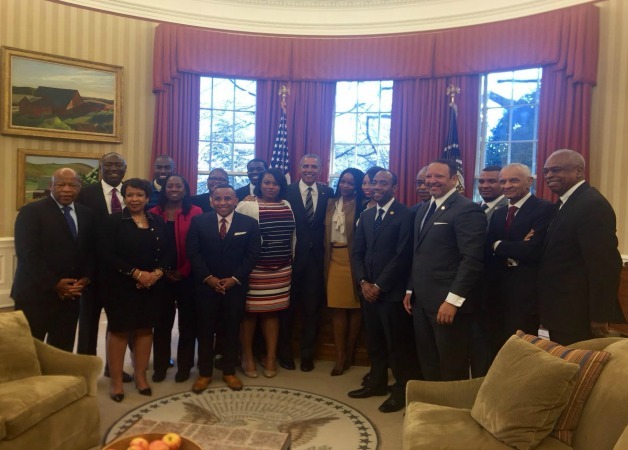 Along with other civil rights leaders, I visited the White House to meet with President Obama, Attorney General Lynch, Senior Advisor Valarie Jarrett and several members of the President's team. I went to represent the ColorOfChange members and Black folks who have been calling for action from the executive branch - the President and the Department of Justice - on a wide range of criminal justice and police reforms. I went to the meeting because their voice has made ColorOfChange unignorable. I accepted the invite knowing that no single meeting or gesture changes power - but the work to organize, agitate and amplify must continue and increase. I went with belief that presence alone isn't power - it doesn't change written or unwritten rules - but presence is important to building power. And without outside power, our movement has no leverage. I went to the meeting understanding that any elected official despite their politics, inspirational backstory or good intentions has to be pushed and challenged. That is how we make democracy work. During the 90-minute meeting with the President and his staff, I reminded him of ColorOfChange members working to fight the race-baiting attacks against him and his family during the 2008 election, our two-year corporate campaign that led to the firing of Glenn Beck (our campaign forced over 200 advertisers to pull their support from the Fox News show) for Beck's racist attacks on the President and his consistent on-air racism. However, I spent the majority of my time urging the DOJ to use its power to deal with the civil right violations with money bail that kept folks like Sandra Bland in Texas and Kalief Browder in Rikers Island in the hands of the state. I spoke about our work around district attorney and prosecutor elections (the President responded by saying that it was a very smart strategy - I welcomed him to bring his voice to this work). I talked through our current and upcoming campaigns on private prisons, prison labor and all the other structures that incentivize mass incarceration and directly asked the President to help us elevate the connections between money in politics and mass incarceration. I spoke about the need for culture change and our growing work in Hollywood to change images and perceptions because in less than a year President Obama will be a powerful person with a big platform and some free time. I also let him know that we had some challenges with the federal legislation on criminal justice reform; I made it clear that while we respect the desire to "get something done," the amendments being batted around would do more long-term damage than good. This was my first time sitting face-to-face with the President to ask questions and share ideas. He is a person who has inspired me and many ColorOfChange members and represents progress and change; a man we have both supported and ran campaigns where he was the target. In the Eisenhower room where the meeting took place were some friends to ColorOfChange and some leaders and organizations that we've been at odds with publicly on issues like Net Neutrality and corporate influence. At ColorOfChange, we value our independence and haven't spent a lot of our time in endless meetings on Capitol Hill or in government offices. We've worked to build the type of people-powered campaigns that rely more on our strategy and members than our money and connections. Last week we accepted an invitation to sit across from the President of the United States and talk about the issues we've been raising for years. Nothing about last Thursday changes the ongoing work we must do to challenge and change the conditions that incentivize mass incarceration and police brutality. We went into and left the meeting, clear that we can not let up on the work to elevate the voices of Black folks and our allies through campaigns and advocacy that force those in power to respond, listen and act - to translate our presence in the world into the power that changes it.